When Company of Heroes burst onto the scene in 2006, it felt like a real time strategy game from the future. It had incredibly detailed visuals, fully destructible environments and a cover system for units that contributed to deep rock-paper-scissors gameplay which was designed in such a way that fighting was intense and continuous throughout both the excellent campaign and multiplayer components. Seven years later and Relic has finally released the sequel, and surprisingly little has changed. At a glance, the game might seem like a big expansion rather than a proper sequel. However, after playing the game it is safe to say that there are enough positive tweaks to the formula that help it feel like a different and ultimately better game which still retains the core design that made the original so compelling back in 2006. 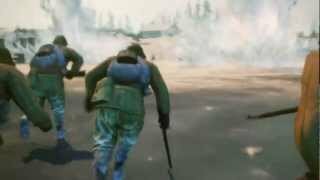 The most obvious difference between Company of Heroes 1 and 2 is the setting. The first game followed the compelling but heavily used tale of American soldiers fighting through Europe immediately after D-day. The sequel takes place on the Eastern front, with the campaign following the invasion of Russia by the Germans in 1941 all the way to the eventual Soviet victory at Berlin four years later. The morally questionable tactics employed the Red Army are dealt with head on in the campaign, albeit in a rather ham-fisted way, and as a result you don't really feel like a hero as you send scores of men to their deaths in order to achieve victory. The lengthy campaign covers the entire conflict between the Germans and Russians, with the first set of missions involving frantically defending against the Nazi blitzkrieg. As the Russians eventually held the Germans back at Stalingrad and started pushing toward their borders in the war, the mission design changes as well. Instead of telling the story of the conflict in a straightforward manner, a narrative framing device is used to dig into the morality of the war. The missions are played as flashbacks from an ex-Red Army officer who is being interrogated in a Gulag several years after the war. The brutality of the Red Army is dealt with in a rather hammy way thanks to cheesy Russian-accented voice acting and stiff facial animations rendered in a game engine designed for an isometric overhead view. This framework really doesn't add much to the game, but fortunately these cut scenes are brief and can be skipped, and the never interrupt the gameplay. The tale of the brutal conflict is compelling enough on its own, and missions are contextualized in this regard with a simple paragraph as each one loads. The campaign contains fourteen missions overall, many of which lasting in excess of one hour if you attempt to complete bonus objectives. Most missions are multi-staged; you might start out having to gain a foothold in a town, then defend against a counterattack, then capture the remainder of the town. Many missions allow you to field large numbers of units, and frantically micro-managing so many different squads on multiple fronts can become a significant challenge. The endless stream of conscripts you can call in for these missions might tempt you to create a big ball of infantry, but this tactic will only get you so far as mortars and machine guns will halt your progress if you rely only on these troops. To help them out you can recruit specialized units that will allow you to destroy tanks and take out machine guns. A handful of missions have you carefully controlling just a few squads, with the best of these taking place during the winter where you must hunt down a tiger tank with only a few limited anti-armor means at your disposal, making for a tense cat-and-mouse game. 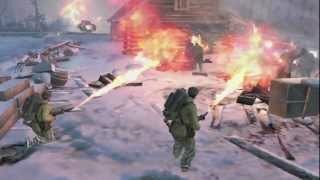 The winter weather effects are one of the new additions to Company of Heroes 2, although they are used in only a handful of missions during the campaign. When fighting in the winter, blizzards will periodically sweep through, and these bursts of snow and wind will freeze your troops to death unless you place them beside fires or inside buildings, at which point vehicles and cold-resistant snipers will rule the battlefield. There are also pockets of deep snow that will slow down troop movements and reveal footprints and vehicle tracks. Lakes and rivers freeze over, allowing for some opportunities to flank, although the ice can be destroyed using explosives and mortars, meaning you need to be very careful when maneuvering valuable tanks across these features lest they sink before seeing any action. While winter weather is one of the most dramatic additions to the series, a number of tweaks have been made that improve the experience appreciably. Tanks now have a 'reverse gear' option which lets you control direction of movement, a small change that makes a big difference when you are trying to pull a tank out of a losing battle without exposing its weaker rear armor. Troops can now vault over low fences, an addition which players of the first Company of Heroes will likely appreciate greatly. During tank battles, it is possible for a tank crew to abandon the vehicle, allowing infantry from either side to commandeer and repair it. The way points are captured has also been altered; now there is a zone around each capture point, and to capture it you must move friendly troops into this zone while it is also clear of enemy forces. This allows combat to continue uninterrupted while points are being captured and further increases the intensity of the combat in both single and multiplayer battles. Apart from these relatively small alterations, the core gameplay from the first Company of Heroes remains intact. Troops must be placed in cover if they are to survive for long, armor can only be damaged using specific anti-armor weaponry and infantry will still get suppressed by machine gun fire. Buildings can be garrisoned and destroyed, and walls smashed through to open up new tactical opportunities. The rock-paper-scissors gameplay that was so compelling seven years ago remains very strong today, although unsurprisingly it doesn't feel quite as fresh and original. If the singleplayer campaign doesn't quench your thirst for historically contextualized encounters, the new Theater of War mode offers up another set of co-op and solo scenarios for both the Soviets and the Germans. Some of these are basically just skirmishes against the AI in the developers' characteristic victory point control mode, where you must capture victory points to reduce the tickets of the opposing team to zero. The only difference between the normal skirmishes and Theater of War skirmishes are that you are only granted access to weaponry that existed during a certain year, with the game currently offering missions exclusively from 1941 (the following years will come in the future as DLC). Other missions are more interesting, and might involve defending against waves of attackers or destroying a certain number of buildings held by enemy forces. The Theater of War missions can be quite challenging compared to the campaign, with the German missions being conspicuously more difficult than the Soviet ones as many of the most powerful German units are not available in the 1941 time frame. The AI that you face in both the campaign, skirmish and Theater of War modes can offer a significant challenge, even on the normal difficulty setting, but it can behave in odd ways. Enemy squads might simply wander past your forces, ignoring incoming fire, in order to reach some distant location. In some Theater of War missions, they might ignore victory points and instead opt to send waves of infantry into your base. Apart from these infrequent oddities, the AI is generally good and can make for some challenging and dynamic battles. Pathfinding could be an issue in the first Company of Heroes and it is improved in the sequel, particularly with vehicles, although when large groups of vehicles and infantry are trying to squeeze through a small gap they take a long time to sort themselves out. The Soviet SU-85 seems to drive everywhere backwards, going into battle with its gun pointed the wrong way and its rear armor exposed in lieu of excessive micromanagement. If you would rather test your abilities against human players, there is a robust and deep multiplayer mode that now features the new winter weather on some maps which can alter strategies significantly. Fuel and munitions points remain but are few in number, instead you now must garrison basic capture points with either fuel or munitions upgrades. Also new is an account leveling system and unlocks, an addition that frankly seems out of place in a genre where balance is so difficult and precarious. As you level up, you gain access to perks that offer up small boosts to individual unit stats. Many of these perks take a long time to unlock, meaning that more experienced players might win using tactics which are not viable to newer players. Perhaps even more egregious is that fact that commanders must be unlocked. The commander trees from CoH 1 have been replaced; instead you now choose three of about ten total commanders from each side to access in game. When you choose a commander, you gain access to a linear set of temporary active buffs and unit or artillery call-ins that become available as the match progresses. Many of the commanders must be unlocked, and this is where the biggest potential problem with multiplayer balance is. Some of the most powerful units such as the Tiger Tank and Soviet ISU-152 are only available to commanders that are unlocked at higher levels. Fortunately you can still level up and unlock these commanders by playing the Theater of War mode and offline against bots, but these unlocks still feel out of place in a competitive RTS. The balance is actually surprisingly good given all of the unlocks, as most perks only grant 2-3% bonuses to health or damage. Given the randomness of the game - where the first mortar shell in a barrage lands, if a tank shell penetrates or deflects - these small changes to stats really aren't noticeable in-game. It also helps that the matchmaking system attempts to match players of comparable levels, although this is not indicative of skill it at least ensures players facing each other have for the most part access to the same perks and commanders. While matchmaking is usually very fast at finding a game, it will group players from all over the world, resulting in some significant lag in some games. The peer-to-peer matchmaking system also means that one player with a slow computer can cause an entire game to lag. If a player causes the game to lag too much, a popup will grant other players the option to kick the offender. When Company of Heroes first released in 2006, it was one of the most technically advanced games on the market. Even now it stands up as one of the best looking real time strategy games around. It is no surprise then that the sequel uses the same engine, and as such the visuals don't impress in the same way they did seven years ago. Still, the game looks good with incredibly detailed units; the snow effects are particularly impressive as deep snow deforms under vehicles and infantry. If you want to turn all the settings up however, be prepared for some slowdowns during blizzards and large battles, even on high end machines. One good addition to the engine is a change to the way fog of war works. Now instead of a circular field of view surrounding units, they can't see past solid objects like buildings, but can see further when placed on high ground. This allows for some sneaky ambushes and flanking maneuvers, and encourages awareness of the environment. 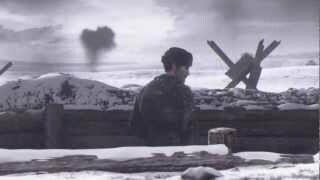 If the visuals in company of heroes 2 don't wow you, the sound effects most certainly will. The sound design is some of the best around, with weapons sounding distinct and detailed. You can hear and differentiate individual shells flying through the air, from the high whistle of mortar shells to the low shriek of an Elephant Tank's massive armor piercing rounds. When a blizzard moves in, sounds are muffled with the occasional sniper shot ringing out through the wind. The musical score is a sombre orchestral affair that suits the gloomy tone of the Eastern front very well. Soldiers yell out in reaction to what is happening, with snipers whispering while camouflaged and yelling out in panic when taking fire. Ultimately, Company of Heroes 2 feels like one for the fans. It addresses most of the few issues present in the first game while retaining the core gameplay that made it so great. There are dozens of hours of gameplay here for both singleplayer and multiplayer, and the majority of it is of high quality. By Relic's standards Company of Heroes 2 is an extremely conservative sequel, but the superb core gameplay design was in no need of major alteration. While it won't shake up the genre like its predecessor did so many years ago, Company of Heroes 2 is a great sequel that will keep fans clicking away for some time to come. Visuals don't wow like they did 7 years ago but audio design is some of the best around, although voice acting can be hammy during the campaign. The rock-paper-scissors gameplay of the first game returns and remains excellent, winter weather and a few tweaks make for a smoother and more varied experience. You'll feel like a war criminal rather than a hero during the campaign, but strong and varied mission design plus the robust Theater of War mode offer a lot of enjoyable solo content. Despite balance shaking perks and commander unlocks, solid base balance and the inclusion of winter weather make the multiplayer intense, exciting and extremely rewarding if you manage to win. Co-op Theater of War missions and skirmishes are a great deal of fun as well. Frame rate drops during large battles and blizzards, lag during online games can be an issue and I experienced a few crashes during the campaign. While not the revolution its predecessor was, Company of Heroes 2 offers up a huge helping of high quality RTS gameplay for both multiplayer and singleplayer.